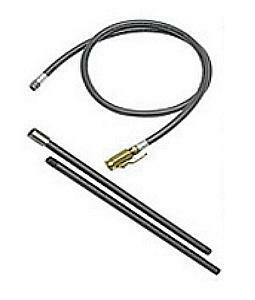 PRODUCT: DOW #294063 REPLACEMENT 4' DISPENSER HOSE WITH ON/OFF VALVE & DISPENSING WAND / COUPLER (tank not included). PRICE/SET. DESCRIPTION: For use with Dow Insta-Stik Bottles / Kits. This set system replaces old #158411/238581 wand and #180607 hose parts. DOW # 279399 Insta-stik quik, roof insulation adhesive, tank only (23 lbs of adhesive -- shipping weight 31 LBS). Note: For large jobs, mfg. recommends ONE BOTTLE KIT for every 4 bottles (1+4) of INSTASTIK.